Social media will continue to grow and expand and Associations will need to embrace social media in everyday activities if they want to continue to grow and keep members engaged. Gone are the outdated mediums that would usually be used to promote the organisation, both internally and externally, via a pre-historic website and email newsletter blasts. Social media is about the convergence of information and communication which is every association’s goal, to inform and communicate to members regularly in order to increase member engagement for your community. As a result, Associations need to strategically leverage all social media opportunities to build engagement among members. If you don’t yet have any social media accounts, make time to create social strategies and then choose the right medium for which you want to connect with and share your association’s content. This in turn will see rewards as members become more involved with your association. If this all sounds like another language to you, and you have absolutely no idea where to start, then Member Evolution can assist you with developing a member engagement strategy to suit your specific member base. 2015 is the year to become a leader in social media, so teach your members how to use social as a tool. The more members that learn and use social media, the more they will be able to use it in their own workplace, as well as being able to get involved in your social activities, discussions or events, all of which leads to a satisfied and engaged community. Member collaboration hubs are vital for members to express their thoughts on topic specific content. If communication hubs are ignored in this rapidly changing digital space, organisations may lose potential members. Members have the freedom to go elsewhere to LinkedIn groups and other competing communities which can be created virtually overnight in the digital world. So it is very important to keep your audience engaged in your community, provide them with great content and resources, and keep them well informed to avoid losing them to other competing communities. As you would appreciate, members and industry professionals like to be consistently up to date and involved with the latest techniques and content, so why wouldn’t like minded people want to collaborate for the benefit of themselves and one another? This is where collaboration hubs excel and 2015 will definitely see a trend for collaboration networks. Association web designs are constantly changing and updating as we see a shift towards more visually appealing and user friendly designs. The increasing use of mobile and tablet devices has also seen a shift towards mobile or responsive websites. Member Evolution has seen one our clients experience a growth from 7% - 35% in tablet and mobile device usage over a 12 month period, with more people accessing their site remotely than ever before. This would not be an unusual trend amongst most associations as it is common that consumers will continue to increase the need to be connected on a 24/7 basis. It therefore makes sense that they would want to access content conveniently via mobile devices whilst on the move in their daily lives. 2015 will see an increase in large images and videos being used both on the homepage and throughout the site. Websites need to be visually appealing and excite users to want to click through to read and learn more, which leads to increased involvement within your community. Not only does your website design need to be attractive, but the content needs to tell a story by taking the user on a logical path and journey throughout the site. Users need to be directed to where they want to go without them even realising. Logical 'calls to actions' make this possible for example; read more, learn more, access now or free download now. Responsive designs are changing the way websites are used, and therefore menus, and other content navigation elements need to be re-considered to fit with the responsive framework. Pages need to present well on any size device, as well as be functional. Current trends indicate that responsive design is the future for all community driven websites. Your content strategy needs to be well thought out and really engage the user to think about what they need or want. The real question is how you drive members and non-members alike, from a position of apathy to action? Websites needs to contain such good content that it sends the viewer into a sense of despair wondering what they are not doing, are they keeping up, or what do they need to do, thus leading them to ask a question or enquire about a problem. This process gets the user thinking, and in order for them to answer these questions, or solve the problem, they will need to undertake some research. This is where your association’s resources and tools aid the process through making them perform an action. This could be signing up to become a member because they see the benefits in becoming a member to receive information, white papers, discounts or exclusive content access. The whole purpose of a membership website is for users to enhance their skills and knowledge, so why not get them thinking and doing. 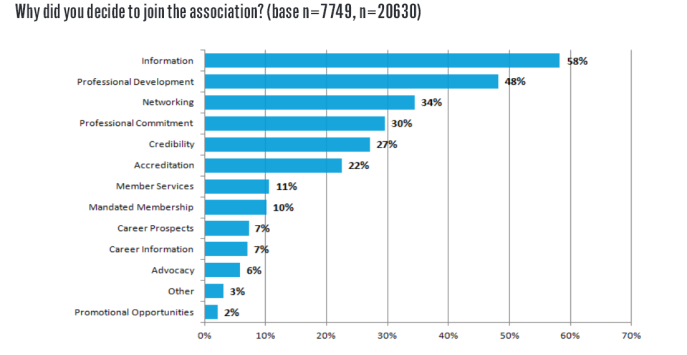 Members value education as one of the key value drivers of their industry association. The 2013 Association Matters Sector report highlighted 58% of respondents joined an association due to the information provided, and the second highest reason was for professional development at 48%. 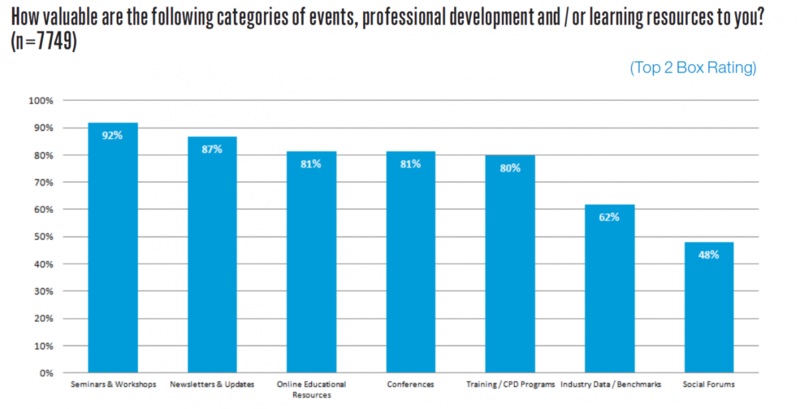 Another graph highlighted how valuable each category was to members, and seminars and workshops came out on top at 92%, followed by newsletters and updates at 87%, and online education resources at 81%. There is no doubt online educational resources will continue to grow as they become much cheaper to deliver while still providing high levels of information and education to members. Online eLearning is also becoming more readily accessible for members via open source tools such as Moodle, now available via online platforms including tablets and smart phones. Become better equipped for the future through looking at trends and the needs of consumers. Member Evolution can assist you to provide a strong social strategy for your members by working with you to understand your members and their needs and then setting a path forward for you into 2015 and beyond. Simply contact us for a no obligation quote.